“A little extra nutrition,” he’d say. My father was super lazy about cleaning vegetables from the garden. Proud to be eating something he grew and under the belief that rain water was all you needed, lettuce always came extra crunchy. There were many moments where I would come face to face with Sammy the Snail, wrapped around my fork, sporting the same horrified look. To this day, I will not buy lettuce that isn’t prewashed. I hate eating bugs and I hate touching them. This is not so much a problem in North American where vegetables are sold pristine. In Europe lettuce comes á la slugs and to add to the trauma they make you pay by weight. I know it’s a waste of money. I know it’s bad for the environmental and probably sprayed down with preservatives but unless it’s prelavée I can’t eat a salad without shuttering. And I’m more than willing to do my own manicures to offset the cost. The problem is that along with my aversion to unwashed lettuce, I also hate parsley. If a meal can be compared to a sonnet, parsley is the herb that screams while you’re eating it. 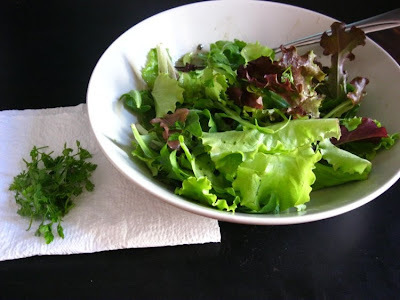 I don’t understand why anyone would garnish a dish with parsley let alone put it in a bag of prewashed lettuce. But there you have it. If I thought I was getting out of manual labor, God’s having the last laugh. Parsley is much more difficult to remove. As I work hard at this salad, most likely loosing more calories than I'm gaining, I try to keep a grateful attitude by focus on all the lives I'm saving while I eati it.